Peak hiking season is finally here. But warmer weather increases the chance of getting caught in a thunderstorm while out on the trail, especially during the afternoon. Be watchful for storms that produce lightning, particularly when hiking in open areas where you may be the tallest object. Lightning safety is vital for hikers of all levels. According to the National Weather Service there are, on average, roughly 20 million lightning strikes that result in 273 injuries and 48 deaths in the U.S. each year. North Carolina ranked 3rd and Tennessee ranked 5th in total lightning fatalities between 1959 and 2007. Moreover, National Geographic estimates the odds of being struck by lightning to be only 1 in 700,000 in any given year. However, over the course of a lifetime, your odds of being struck jump to 1 in 3,000. Although it may seem counter intuitive, according to the National Outdoor Leadership School, lightning density maps show more lightning at lower elevations than on the ridges in the Appalachian Mountains, where the air is more humid. In the Rocky Mountains, the opposite is true. 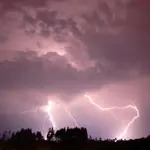 Lightning strikes occur more often at higher elevations as a result of the drier climate. The good news is that the number of lightning-related fatalities has trended downward since 1940, when deaths were measured in the hundreds. There are probably several reasons for this, including a much better understanding of lightning, and thus a better education on lightning safety and avoidance. So, what can you do if you're out hiking and a storm approaches? The first thing you need to understand is that lightning can strike more than 10 miles away from the center of a thunderstorm—well beyond the audible range of thunder. Therefore, if you hear thunder, you're already within striking range of a storm and should seek shelter immediately. Buildings with exposed openings such as backcountry camping shelters or picnic pavilions are not safe. Get away from water, and avoid any low spots that accumulate rain run-off.